I suppose it's rather fitting, considering 2017 marks 200 years since her death, that this year has been the year I discovered that I like Jane Austen. This year has also been the year that I started showing a real interest in the Georgian and Regency eras in terms of its history, so I've found myself seeking out more fiction and non-fiction set during this time. 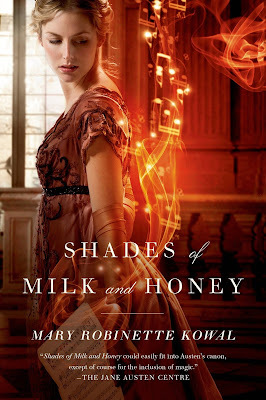 If you've been following my blog for a while you'll know that I love historical fiction and especially speculative historical fiction so, described as Jane Austen with magic, Shades of Milk and Honey has been on my radar for a while now. Firstly, if you're looking for something quick and easy to read, this book is for you. I started reading it during an hour-long train journey and by the time I'd reached my destination I'd read a quarter of the book. The beginning moves so quickly without feeling at all rushed, and it's so much fun to read. While reading this book it was so easy to tell that Mary Robinette Kowal had lovingly crafted it from her adoration of Jane Austen, Pride and Prejudice and Sense and Sensibility in particular felt like real influences here, yet the book didn't feel like a rip-off and it easily could have. The most interesting part of the book for me was the 'glamour'. The manipulation of glamour is seen as yet another skill that an accomplished young lady should master to help her be even more eligible, but they have to get the balance right - as with most things for women in history, too little or too much of anything is something they can be criticised for. For example, some women might use glamour to give themselves straighter teeth or a less crooked nose, but too much glamour will make them look unnatural and will make it obvious that they are using glamour. Our heroine, Jane, is exceptionally talented at the manipulation of glamour but, not traditionally beautiful like her younger sister Melody, has failed to attract a husband. Now in her late twenties, Jane has resolved herself to spinsterhood and instead tries to help her sister find a husband. There was something very Elinor and Marianne about their relationship, and I liked that Kowal didn't do what I was expecting in regards to Melody; while Jane envies Melody her beauty, we also discover that Melody also admires Jane for her skills with glamour. Melody is pretty, but she's genuinely afraid that she might only attract a husband with her pretty face and have nothing else to offer him, or that she might attract the wrong kind of husband when she believes she has only her appearance to offer. Having said that, I did grow a little tired of the amount of times Jane and Melody seemed to bicker about the same thing. I didn't expect them to resolve their issues instantly, but I would have liked to have seen them supporting each other a little more throughout the story, particularly as Melody seemed to become a little silly as the story wore on and I thought it was a shame she was reduced to that kind of stereotype. Speaking of Vincent, while I did like him and Jane together I was hoping for something more. For me they seemed to fall in love very quickly, and I would have enjoyed something more drawn out. There were hints of some sizzling chemistry there but there wasn't quite enough there to make the romance anything but nice. In fact I felt like the entire end of the book was rushed and a little too sickly sweet, but, ultimately, this book is a fun, harmless read. Is it outstanding? No. Do I want to carry on with the series? Yes, I think it's the glamour that really shines in this book rather than the characters and the plot, but as there are four more books in this series I have a feeling they'll both continue to develop. In fact I'm hoping that Kowal will also include more people in this series that Austen excluded from her own work, such as the working class, the LGBT+ community and ethnic minorities - especially as the Slavery Abolition Act wasn't passed in the UK until 1833. Whether you're an Austen fan, a historical fiction fan or a fan of magic in books, I think this is a story that's worth checking out. I'm planning to pick up the second book in the series, Glamour in Glass, fairly soon! I had mixed feelings about this book-- I really liked the /idea/ of it, but I felt like it didn't live up to my expectations. It felt a little derivative, which is silly considering how novel the magic system was! I know what you mean - I'm hoping it's the kind of series that will get better and better with each book!